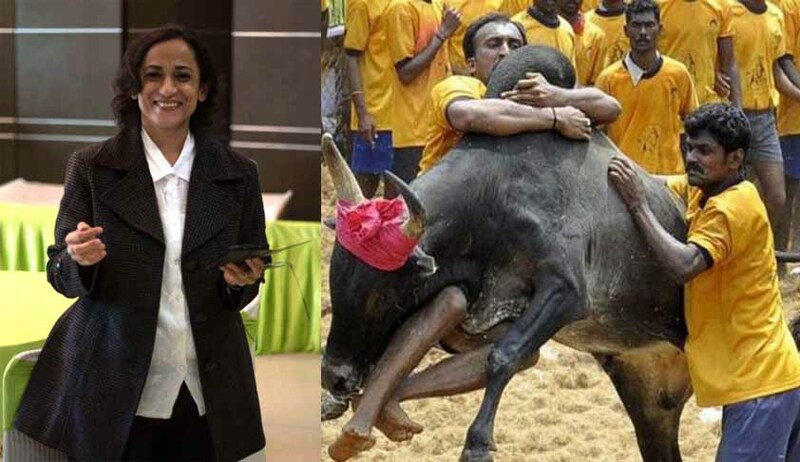 Soon after an interim application in an earlier writ petition was filed on behalf of the Animal Welfare Board of India (AWBI) before the Supreme Court requesting a stay on the operation of the new law passed by Tamil Nadu Assembly to allow bull-taming sport jallikattu, the board’s secretary, also an official in the Environment Ministry, has sought withdrawal of any kind of petition filed by the board in the court. In its application, the AWBI had asked the court to stay the operation of the Prevention of Cruelty to Animals (Tamil Nadu Amendment) Act, 2017, which has been effective since January 23 (Monday), and allows the conduct of jallikattu across Tamil Nadu. A bench of Justice Dipak Misra, which is hearing the AWBI’s original petition against the Centre’s 2016 notification, agreed to hear the interim application on Monday. However, AWBI counsel advocate Anjali Sharma, who is also a sitting member of the AWBI and convener of its legal sub-committee, told Live Law that she was authorised by the board to file the application. An Interim Application for Directions with respect to the Tamil Nadu Ordinance has been filed IN the existing Writ Petition No. 23 of 2016 which the AWBI had filed in January, 2016, challenging the Central Government Notification of January, 2016, permitting the use of bulls in Jallikattu. There are 3 (THREE) petitioners in the existing Writ Petition. I am one of the petitioners – it is not just the AWBI, but I am petitioner too, in my individual capacity. The Interim Application in the existing Writ Petition No. 23 of 2016 was filed AFTER the Secretary, AWBI, issued anAuthorization in my favor on 24th January, 2017, which he forwarded to me vide an e-mail in which the Chairperson, AWBI, and the Vice-Chairperson, AWBI, are both copied. ADDITIONALLY, before the AWBI filed its main Writ Petition No. 23 of 2016 (in which the present Application has been filed), the Members of the AWBI had authorized me and the then Chairperson of the AWBI to file and sign the Petition and all related case papers through a Board Resolution that was passed with overwhelming majority. I am an Executive Committee Member of the AWBI, and the Convener of its Legal Sub-Committee. Both, the Board Resolution in my favor, and the Authorization, have been filed before the Hon’ble Supreme Court. They are a part of Court record. It is also pertinent that the Authorization now issued in my favor, was issued after the Members of the Legal Sub-Committee of the Board (comprising of 6 Board Members, including the Chairperson and Vice-Chairperson) again consented through e-mails exchanged on 23rd January, 2017, to my representing the Board and signing case papers in this case. In any case, since I am one of the petitioners in Writ Petition No. 23 of 2016 (in which the present Application has been filed), I can file any application on my own behalf. The AWBI had challenged the Central Government Notification in January, 2016, through Writ Petition No. 23 of 2016, because it was violative of the 2014 judgment passed by the Hon’ble Supreme Court in the case titled “AWBI Vs A. Nagaraja & Ors.” The same Board continues to exist today with the same Board Members. Only the Chairperson has changed. I had no reason to believe that the Board has changed its opinion regarding Jallikattu, because no contrary instruction was ever issued to me. On 25th January, 2017, I suddenly received a communication from the Secretary requiring me to withdraw any Petition filed against the Tamil Nadu Ordinance. I have not filed any Petition, I have only filed an Interim Application in the existing Petition, with the full consent and authority of the AWBI. The Secretary’s letter has NO LEGAL SANCTITY. However, rather than encourage the controversy that has erupted, I will inform the Hon’ble Supreme Court of whatever has occurred, and in order to focus on the real issue, i.e. the JALLIKATTU ISSUE, I will press the Interim Application and the existing Writ Petition as the Petitioner No. 2 which I am in this case.